Nicola Twilley argued in favor; I argued against. You can watch the debate here. As I tried to tease out in my presentation and in the question period that followed, I think that there are three ways to interpret this question: one purely empirical; one partly empirical and partly moral; and one completely moral. First, can design result in less suffering? Of course it can. As a purely factual matter, we can design systems of animal exploitation that result in less suffering. That’s clear. But it is also an uninteresting way to interpret the question. I do not believe that Nicola and I had any disagreement here. Second, we can ask whether design can reduce suffering to a point where we would feel comfortable in consider calling the resulting level of exploitation “humane.” That is how I understood Nicola to interpret the question. This is a mixed question that involves moral and empirical components. As I discussed in the debate, because animals are chattel property, there are structural limitations on how far industry can go in reducing suffering. For the most part, our “humane” treatment is limited by economic efficiency: we protect animal interests to the extent that we get an economic benefit from doing so. So efforts to make treatment more “humane” are usually coextensive with efforts to reduce inefficiencies and increase profitability. That is exactly what slaughterhouse designer and meat-industry consultant Temple Grandin does–and acknowledges that she does. She focuses on industry inefficiencies and proposes ways to reduce those inefficiencies through more “humane” treatment. As long as animals are chattel property, the ability of design to address the issue is structurally constrained. The most “humanely” treated animals are still subjected to what could only be called torture if humans were involved. This not only assumes that “welfare” is consistent with exploitation, but it also tells us that meat-industry consultants who seek to increase the profitability of the meat industry have something to tell us about the welfare of animals as a moral matter. It establishes and reinforces the idea that we can exploit animals “humanely” in this mixed empirical and moral way. In my view, that is simply wrong on both the empirical and moral levels. Although Newkirk’s praise for Grandin is ostensibly bewildering, it makes perfect sense. There is a symbiotic relationship here. Industry needs welfarists like Newkirk to provide a positive moral characterization of their efficiency efforts. Industry needs to have its efforts to achieve efficiency, resulting in largely minor changes to the institutions of animal exploitation, declared “humane” by those identified as animal advocates. But PETA needs industry as PETA uses these efficiency measures to proclaim “progress” and to fundraise. For the most part, the campaigns of animal welfare organizations target economically vulnerable industry practices for precisely that reason. These practices are “low hanging fruit,” so there is an easy “victory” for fundraising purposes. Third, the question can be interpreted as asking whether design can ever make it ethical to consume animals. This makes the question a purely moral one. As I explained in the debate, I believe that we have already answered that question as a matter of our conventional wisdom, which maintains that we should not impose “unnecessary” suffering and death on animals. Whatever “necessity” includes, it must exclude suffering and death imposed for pleasure and convenience or else the moral norm about unnecessary suffering/death is meaningless. But what is our justification for imposing suffering and death on 58 billion land animals and an estimated trillion sea animals every year? We do not need to eat animals or animal foods for optimal health; indeed, mainstream health care professionals are increasingly telling us that animal foods are detrimental to human health. But animal foods are certainly not necessary in any sense. Animal agriculture is, without question, an ecological nightmare. So what’s the best justification we have for inflicting suffering and death–however “humane”–on all of those sentient (subjectively aware) beings? The answer: they taste good; we derive palate pleasure from consuming animals. And no one would accept such a justification in any other context. Think about Michael Vick, the football player who conducted a dog fighting operation. Everyone objects to what Michael Vick did. Because he inflicted suffering on animals for no reason other than his pleasure. But what is the difference between sitting around the ring watching dogs fight and sitting around a summer barbecue roasting the corpses of animals, or drinking milk or eating cheese, where–under the most “humane” circumstances–animals have suffered and died? There is no difference. And as any first-year law student can tell you, it does not matter whether Mary with premeditation shoots Joe or hires Alan to shoot Joe. It’s murder in both cases. There may be a psychological difference between one who engages in violent conduct and one who pays another to do the deed but there is no moral difference, which is why the law treats them in the same way. So I would suggest that the answer to the moral question posed in the MoMA debate is simple: no. If animals matter morally, we have a moral obligation not to impose any level of suffering, or death, at least in the absence of a true conflict where there is compulsion. And that does not exist with respect to our consumption of animals. So let me summarize: if you take morality seriously, and you regard animals as having moral value, go vegan. It’s the only option that is consistent with what we–you–say we believe about the moral status of animals. Anything else leaves us saying that we accept that animals matter morally but that we can disregard their fundamental interests for trivial reasons. That makes no sense. 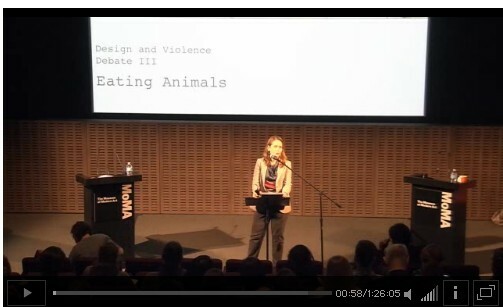 Thanks to Paola Antonelli, Michelle Fisher, and all of the wonderful people at MoMA for having this program, and to Nicola Twilley for participating. “Happy” Meat/Animal Products: A Step in the Right Direction or “An Easier Access Point Back” to Eating Animals?